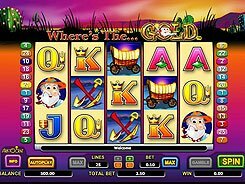 Where’s The Gold is a 5-reel 25-payline video slot themed around gold digging. On the reels, you will come across a pick, a wagon, a gold digger and other themed icons as well as classic playing cards from 9 to Ace. Changing the number of lines and a line bet ($0.02 to $4), you can adjust a total bet from $0.5 to $100 per spin, with all paylines activated. The first, second and third jackpot prizes up for grabs are $4000, $2000 and $1200, accordingly. 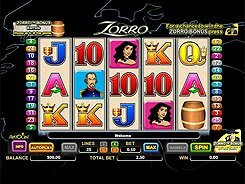 The slot features a wild symbol (Gold Digger) that stands in for other symbols and pays out the largest award mentioned above if five of them hit a payline. 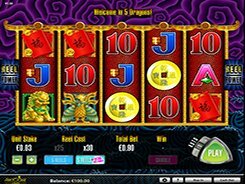 Three or more Dynamite symbols scattered in any place trigger the free spins feature. 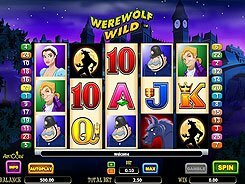 On the second screen, you are asked to pick one of five characters and that determines how many free spins you will get (up to 10) and which symbols (up to 3) will serve as extra wilds to be used as substitutes in addition to a normal wild. There is also a classic Gamble feature offered after a winning round that allows to double or quadruple your win.